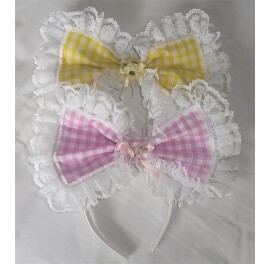 Perfect for the Little girl at heart this gorgeous large stiff hairbow in gingham and lace very sugar and spice! Large stiffened gingham bow trimmed with double lace and ribbon rose detail Attached to a padded satin headband for easy wearing .. Perfect for the Little girl at heart this gorgeous large stiff hairbow in a pretty flower print of your choice, trimmed with lots and lots of frilly lace! Large stiffened bow trimmed with double lace and ribbon rose detail Attached to a white headband for easy wearing One si..
Gorgeous large stiff hairbow in shiny satin in the colour of your choice. 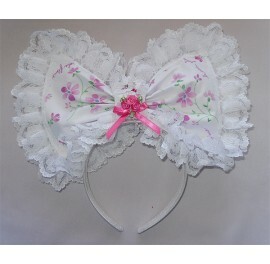 Trimmed with lots and lots of frilly lace and finished with a rosebud bow! 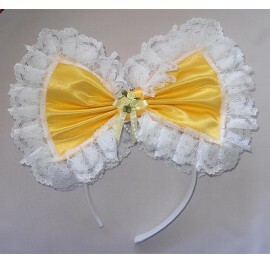 Large stiffened bow trimmed with double lace and ribbon rose detail Attached to adult size white headband for easy wearing One size ..